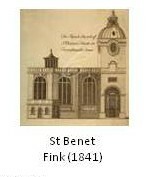 St Benet Fink, Threadneedle Street was originally built in around 1216, burnt down in the Great Fire of 1666, and rebuilt by Wren in 1670-5, only to be demolished, to make way for the rebuilding of the Royal Exchange, in 1841, when the parish was merged with St Peter-le-Poer. 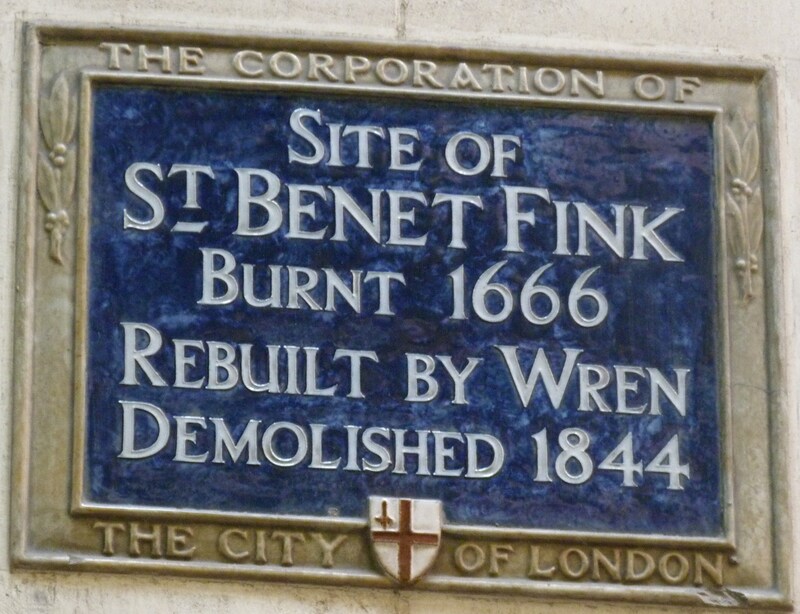 A Corporation “Blue Plaque” marks its former site. Some salvaged communion plate still survives, in the church of St Benet Fink in Tottenham. Salvaged paintings of Moses and Aaron, which were formerly part of the altar-piece, ended up in Emmanuel School in Wandsworth. This entry was posted in Lost Wren churches, Sir Christopher Wren and tagged St Peter-le-Poer, Threadneedle Street on December 14, 2014 by Bob Jones - The Lost City of London.